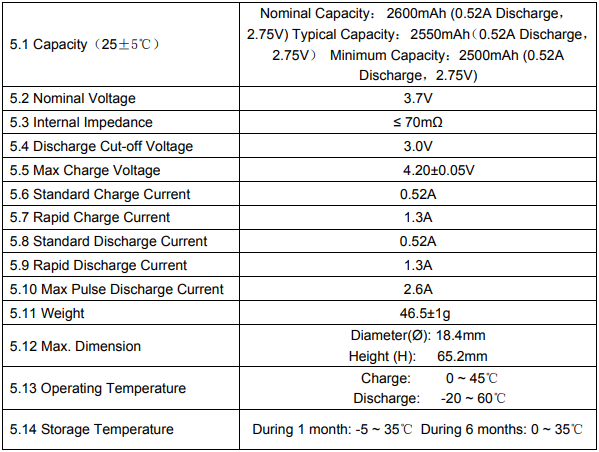 5.2 Nominal Voltage 3.7V: This is the average voltage of the battery over its entire charge/discharge cycle. 5.3 Internal Impedance <=70mohm: This is (primarily) the ESR of the battery over its entire charge/discharge cycle. Whether this condition holds over all environmental and charge state conditions should be noted elsewhere on the data sheet. 5.4 Discharge Cut-Off Voltage 3.0V: If the pack contains a cutoff circuit, it will kick in when the battery pack gets down to 3.0V to prevent overdischarge. If not, you should include circuitry to ensure it doesn't get discharged past this point. 5.5 Max Charge Voltage 4.2V: Don't charge it above this voltage. When charging, you can keep it at 4.2V until the current goes down, but don't try to charge it faster by applying more than 4.2V. 5.6 Standard Charge Current 0.52A: Since they specify a "standard" and "max," I'm guessing they have two endurance specs, one for limiting charge/discharge current to "standard" and another one with fewer cycles if you (dis)charge it at "max" current. Note that you may have to keep the voltage under 4.2 until it's largely charged to avoid exceeding the charge current. Not the answer you're looking for? Browse other questions tagged batteries battery-charging lithium-ion datasheet charging or ask your own question. What does “Sourced from process <number>” mean in transistor datasheet? What does the CT (center tap) value mean in a transformer datasheet?